Nickel sulfide- (NiS) induced spontaneous fracture of fully tempered glass. It is a beautiful spring morning. Imagine sitting at a desk along the outside wall of an office, when all of a sudden, without warning, you hear a sudden pop just like the sound from a 0.22-caliber rifle. On looking up, you notice the glass in the wall next to you has shattered into thousands of small fragments. So, what happened? You likely did not experience an attack, but rather a phenomenon known as spontaneous fracture of fully tempered glass, and unfortunately, you are not alone. Glass as a building material has a long and rich history. When employed in building façades, it not only plays a role in expressing the aesthetic design aspirations of a project, but also provides a separation and connection between the outside and inside. Glass has a wide variety of applications in contemporary construction that have pushed the boundaries of the material’s ability to perform as a structural element, provide thermal and acoustic separation, and regulate daylight and solar heat gain through the building façade. 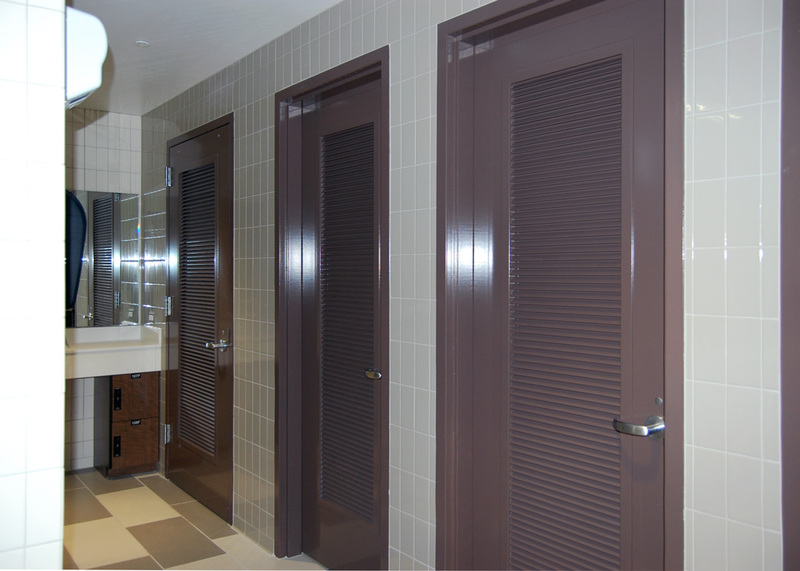 Glass can be highly customized to suit the specific needs of each application, through manufacturing processes such as heat treatment, low-emissivity (low-e) coating, ceramic frit, lamination, and fabrication into insulating glass units (IGUs). 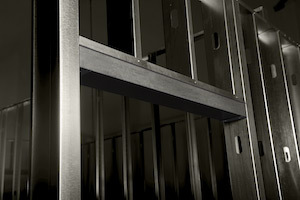 Generally, annealed is the weakest glass, followed by heat-strengthened (approximately twice as strong as annealed) and fully tempered (approximately four times as strong as annealed). In addition to increased strength to resist imposed loads (e.g. wind) and thermal stress, fully tempered glass breaks into relatively small and safer fragments compared to the alternatives, and therefore, is suitable for meeting code requirements for safety glazing. These features of fully tempered glass, however, come at the cost of increased optical distortion and an often overlooked risk of spontaneous breakage in-service. 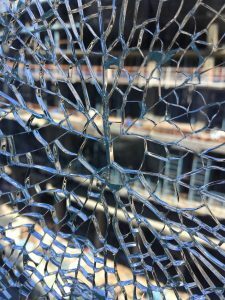 Despite the industry’s recognition of this problem since the early 1960s and manufacturers’ efforts to eliminate it, spontaneous fracture of fully tempered glass continues to this day. 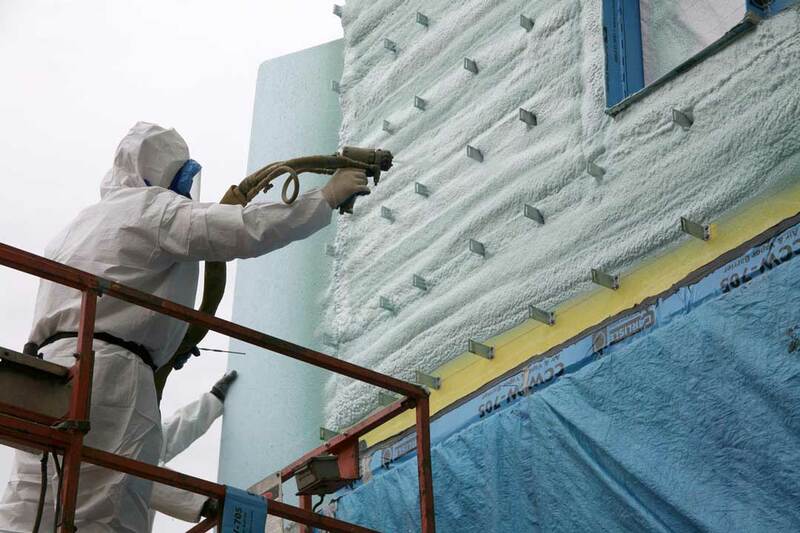 Soda-lime silica glass is the most common type employed in architectural applications. 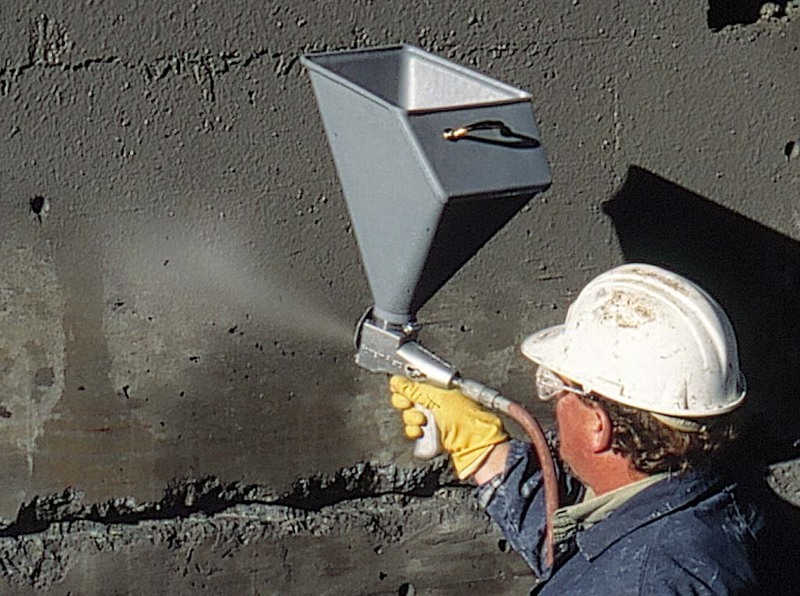 Raw ingredients include silica sand, sodium carbonate (Na2CO3), lime, metal oxides, and cullet (recycled glass). These are heated in a furnace to above their melting temperature of approximately 1500 C (2700 F). The molten glass is then floated (hence the term, “float” glass) on a bath of liquid tin and slowly cooled or “annealed” to not induce any significant residual stresses within the material. Glass is inherently strong in compression and relatively weak in tension. 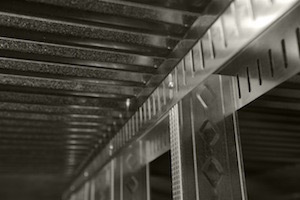 Its strength can be increased through a process known as heat treatment. Typically occurring in a tempering oven, annealed glass is re-heated to approximately 650 C (1200 F) and then rapidly cooled with air jets, also known as “quenching.” This rapid cooling solidifies the outside surfaces of the glass, while the interior core remains hot and fluid. When the core cools and contracts, it pulls on the outside surfaces, thereby introducing permanent stresses, referred to as residual compressive surface stress (RCSS). This results in equal and opposite tensile stresses in the glass core, counteracting the compressive stresses in the surface (Figure 1). The rate of cooling in the tempering oven determines the amount of RCSS within the glass—the faster the glass is cooled, the greater the RCSS. According to ASTM C1048, Standard Specification for Heat-Strengthened and Fully Tempered Flat Glass, minimum RCSS for heat-strengthened glass is 24,132 to 51,711 kPa (3500 to 7500 psi), and 68,948 kPa (10,000 psi) for fully tempered. 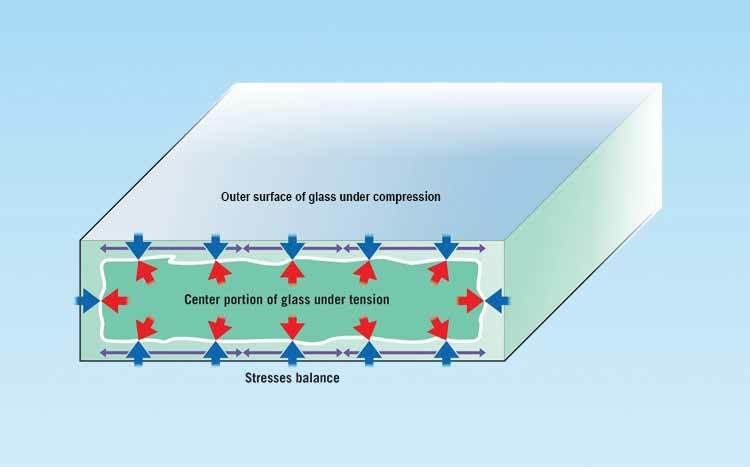 Figure 1: Illustration of internal stress profile of heat-treated glass. Glass is a brittle material. Unlike other ductile materials (e.g. steel and aluminum), glass failure is sudden and often without warning. 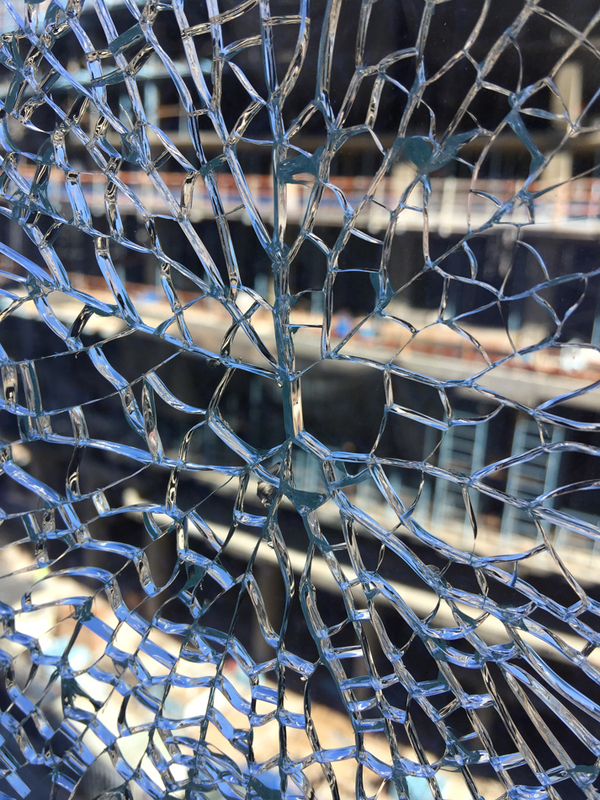 As is typical of brittle materials, the effective in-service strength of glass is determined by the stress concentrating effect of flaws in or on the glass surface. Stress-concentrating flaws at the surface occur from normal handling and weathering of the glass, and are accounted for in design. Since most flaws occur on the surface, and bending stresses are maximum on the surface, the introduction of surface compression by heat treatment is an effective way to give the glass greater load-carrying capacity. Stress-concentrating flaws occur randomly on the surface of the glass and can vary significantly from one panel to the next. Therefore the strength of glass is typically defined by what is called a “statistical probability of breakage” (SPB). This results from the statistical probability surface flaws will be present on the glass, and the ability of these flaws to concentrate stress from external loads and cause fracture. The common industry design standard for SPB of architectural glass upon first application of the design load (e.g. wind load) is eight lites per 1000 (8/1000). A designer may select a lower SPB, say 1/1000, for applications such as overhead glazing (e.g. 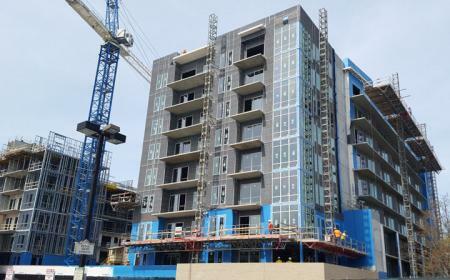 glass sloped 15 degrees or more from vertical) and other critical “structural” applications (e.g. drilled, point-supported, or clamped glass).